Pros: Truly portable XM satellite radio; five-hour memory buffer for timer recordings; built-in FM transmitter; includes all necessary accessories for home and car use. Cons: Fairly expensive; subpar sound quality. Bottom Line: The well-featured Tao TXM1020 XM2go satellite radio receiver brings the XM experience to your car, your home, or on the go. Overall, the differences between the TXM1020 and the MyFi come down to styling. 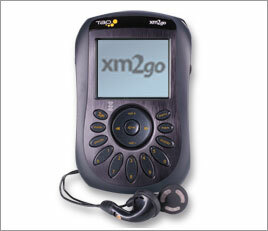 We prefer the look and feel of the TXM1020, but that’s merely a matter of personal preference. Like the MyFi, the TXM1020 is a stand-out product that delivers a portable experience that isn’t available with any competing Sirius radio.